The day started off sunny and beautiful.. but a breeze brought in a few clouds. It looks like we have some rain coming. 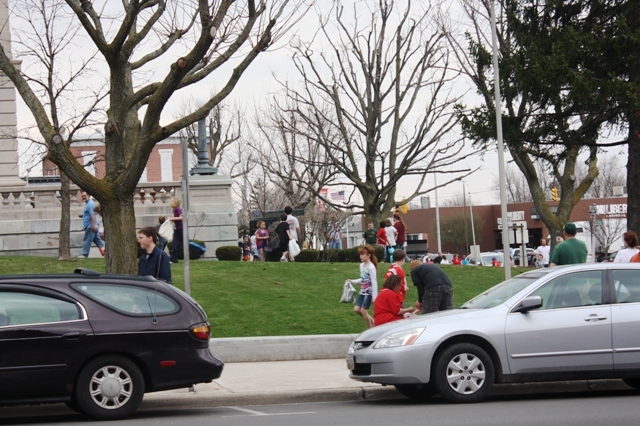 But not before the kids got to enjoy an Easter Egg hunt on the lawn of our Courthouse. We could hear lots of excited screams as the children discovered eggs. It was nice to see so many people turn out for the fun event. We have gotten some Mad Scientist time to create a new product. We have sold tons of our Battery Operated LED Taper Candles so we know you like the look. But, with our being in Shipshewana in an unconditioned building this summer, we are looking for a grubby concoction that will not melt. We have finally come up with a process and have applied it to not only the battery tapers, but electric candles as well. Check out our new light. The boxes are made by a local Amish man and we finish them here ourselves. 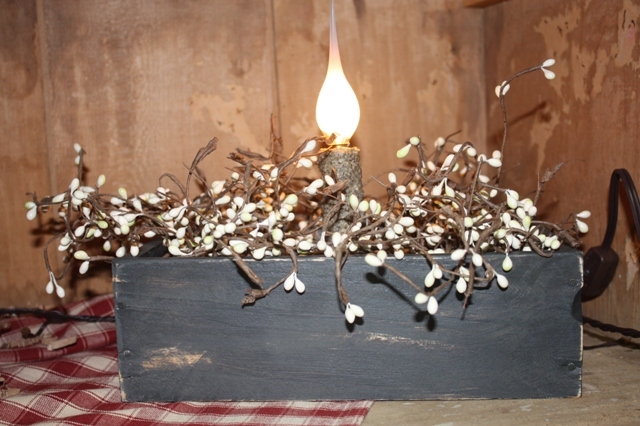 The candle has our new grungy finish. We are planning to make these several colors. Check them out while you are here. All the excitement and kids have kept Bruce busy today. 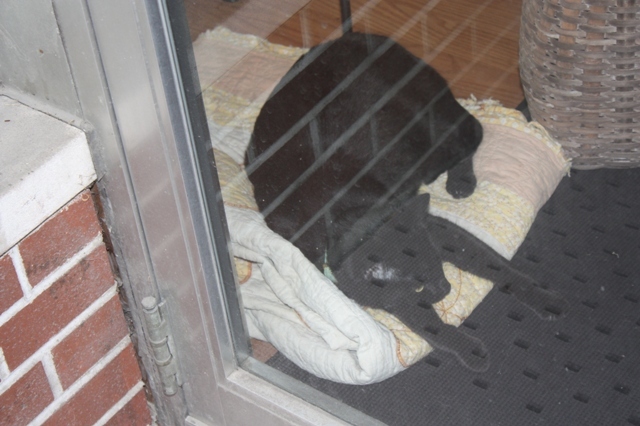 Here he is catching a cat nap.. but notice he is right by the door so as not to miss anybody. He takes being the official Greeter very seriously. I took a walk down to the farmers market before we opened and when I came back, Bruce was looking like he didn’t like being left behind. He got wound up yesterday because a different UPS driver came in and got him a bit fritzed. The regular guy talks to him and pets him.. this guy just left.. and I guess Bruce was a bit put out. So, he was a bit silly all afternoon. Now today, completely out of the usual routine, he got left alone. After following me around a bit, some kids came in and he got busy playing with them. He settled into chasing his string and playing hide and seek under the cabinets with the kids. All was well with Bruce again. Then we got more kids.. the Farmer’s Market brings families to town and we get a lot of traffic because of it. And best of all, Bruce gets a lot of kids to play with. Things finally setteled down in the afternoon and I got busy putting the shop back together. Poor Bruce! All the excitement today wore him out. Instead of napping in the front window.. or on my counter.. Bruce got up in the hutch facing the front door for a nap. I had a step stoole in front of it as I was changing out some stuff on the top, and Bruce just cruised up and got comfortable. If you’ve been reading this blog, you know this is not his first time up here. I imagine it is pretty cozy and it still gives him a birds eye view of the front door so he doesn’t miss a thing. Most of the time he gets up here when I have something in front of the hutch to climb up on. For a shop cat he is pretty good about not getting into or onto things. More often than not he is under things so he can play with your feet as you go by. The hutch isn’t quite finished yet. We are still changing things around. But for now I will let Bruce finish his Cat Nap. Friday, April 17th, Bruce will be a year old. Since he is so much a part of the shop we have decided to throw him a Birthday party. All day long we will have 10% off everything in the shop. If you are a newsletter subscriber you will receive a coupon to double that to 20% off everything in the shop. Not a newsletter subscriber? Join now. We will also be serving Birthday cake and anyone that shows up wearing a party hat can take one of our highly scented wax melts for FREE. So don’t forget to stop by this Friday for the fun. We are inturrupted for the following message..
Well, I am trying to get some work done here at the shop. Bruce.. on the other hand.. is impeding progress. Updating the blog is taking place during his ‘Play Time’ and he is making sure he is having fun. I have bought all kinds of cool cat toys only to find Bruce likes the rings off the gallon milk cartons. He will chase and play with those rings all day long. He has learned to bring the ring to me so I can throw it for him. Off the front of the counter, off to the side, it doesn’t matter. Off he goes.. over computer, off the counter, over my legs..
Over and over.. we throw the ring, chase the ring, pick it up and bring it back. If we don’t throw the ring, he plays with it on top of and in the way of what ever I’m doing. He has discovered it is real fun to drop the ring in the computer keyboard and try to bat it out while I am typing. Moving him and that ring out of the way is just part of his game. Bruce has highlighted and deleted more text than I want to admit. But he is kinda cute and funny when he plays this game, so I don’t usually mind playing along. When we finally have had enough playtime, it is time for some ear scratching and lovin.. then time for a long cat nap. We got a bunch of snow! At this time we are under a Level 1 Snow Emergency. That means “roadways are hazardous with blowing and drifting snow. Roads are also icy – drive carefully.” School is closed, my DH work is closed and I’ve decided to stay home and not deal with being on the roads. Sure, I could get a lot done up at the shop.. but, if this gets any worse I don’t want to be on the roads trying to get home. I lived in Texas for a reason… I hate driving in this stuff. Would much rather stay home and admire the beauty of it all. Here are some pictures outside right now. The side of the house with the drive way and the old maple in the front yard with the field accross the street. We live on a state highway so the road in front of us is usually plowed fairly well. Something I tend to forget and then get to sliding on the other roads I have to travel. Bruce is hanging out in the windows watching the snow and DH plowing. You can see he is very interested. He appears to be quite mesmerized by the whole plowing thing. So typical of a cat, he is very curious about everything.. especially if it involves people. We have two bay windows at the house. One in the kitchen and one in the dining room. These windows have become a favorite spot for Bruce to hang out. Every morning when I come downstairs he is hanging out in one of them. The weather reports says we are still supposed to get several more inches of this stuff. Yuck! I’m still kinda used to having flowers blooming this time of year. Even though I have been up here a while, this is my 5th winter, by January I am tired of dreary winter and looking forward to Spring.. my favorite season. I still haven’t gotten used to winter lasting till March. Time to get some hot chocolate and cozy up in front of the fire! All though the weather is cold and snowy.. inside we are definitely looking like spring. And I am finally getting some things together. This beautiful old hutch is the first thing you see when you walk in our door. It is being done in various shades of blue and has touches of yellow in it. But.. if you look real close.. you will see a unique decor item. Can you see it.. in the hydrangeas.. under the shelf part of the hutch. It seems that Bruce has found himself a cozy perch to take a nap and wait for his beloved people to come in. He hasn’t been up in this hutch for months. During the Fall, he got up into that little cubby hole and took a nap. I was rearranging some things on the hutch one day and stuck some greenery up in there and he came flying out. His exit aged me a few years and my startled scream must have deterred him from that area for a while. Now it looks like he’s back. Probably warmer than napping in the front window these days with below freezing temps outside. If you have visited our shop you have met our official greeter – Bruce. He was out of the first litter our barn cat Daisy gave us. That litter produced 5 little boys. It was my son’s responsibility to handle the kittens every day and take care of Mom. Bruce was one of the 2 black/seal browns. There were also 2 black and whites and a lovely tiger with a lot of white. We named the other black one Tony [Iron Man]. One of the black/whites we called Indie [Indianna Jones]. The other 2 were Bo and Luke Duke. Bruce got his name from Bruce Wayne [he’s the Bat Cat]. When they became old enough they were brought to the shop to give away. Indie going to a new home. All of the kittens were good with the kids that came in and many ladies carried them around while shopping. Bruce loved to sit on my shoulder while I worked and had a wonderful personality so we decided to keep him. He now has a lot of friends that stop by just to see him. My husband was amazed at the number of people that asked about him during our Fall Fest since he wasn’t out and about the shop. With all the traffic in and out of the shop that day, he was put in the back in our production area so he wouldn’t slip out. da Bruce as a baby. Most mornings are Bruce’s playtime. He has stuffed mice and birds, lots of string and the occaisional bag and crinckly paper. His all time favorite toy however, is the ring off a gallon of milk. Deliveries are the high point of his day. Not only do my regular delivery people pet and talk to him.. they bring boxes! Oh he gets sooo excited. It is fun to watch him watch the unpacking. He can hardly stay out of the box through out it all. When the box is finally empty, Bruce gets a turn at playing in/out/on and around the box. Eventually he tire’s of the thing and we can get rid of it. After lunch it is time for a cat nap. It takes a lot to convince him to sleep somewhere besides my counter. If the sun is shinning ,the front window can sometimes tempt him to nap there. Most days I have to put him under the counter on the bags to get any work done. Oh the look I get for disturbing him. I always get asked where he spends the night. By closing time Bruce has rested up and is looking to go home. He has a pretty blue carrier that he goes into for the ride to and from the shop. Longer trips, like my recent trip to Texas, he is allowed out in the car and spends most of the time sprawled accross my lap during the drive. As far as Bruce is concerned… being a Shop Cat is the life.